The item is manufactured by Tecno Tubo Torino of Italy which labelled products under "3ttt" brand..3T was originally called Tecnologia del Tubo Torinese (Turin Tube Technology), taking its name from the city of Turin, where it was founded in 1961 by Mario Dedioniggi. Though written 3T, it’s usually called Triple T.
Handlebar width is 44 cm out-to-out. 3ttt was first to create time trial bars in the now ubiquitous 'bull-horn' design, which they did for Francesco Moser in 1984. He used this handlebar to set a new world hour record of 51.151 km (31.784 miles). Thereafter, this handlebar became known as the '51.151'. 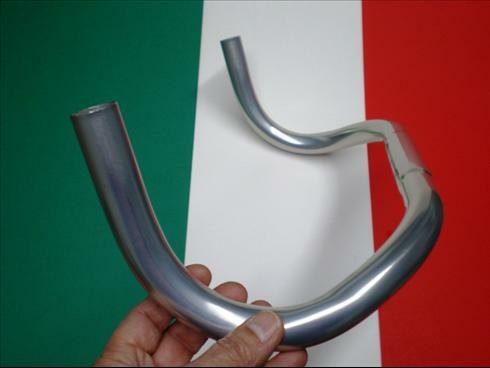 Italian company specializing in the production of aluminum handlebars, however they have also produced seat posts, stems, and saddles.